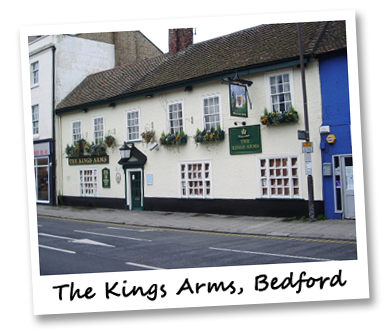 Ukulele Bedford meet once a week on Wednesdays at The Kings Arms (24 St Mary’s Street, Bedford MK42 OAS). Meetings start at 7.30pm (ish!) and usually finish at about 10pm. We have a short break in the middle to recharge our glasses and have a natter. Some members come every week - others come as and when they can. Either way, that's fine. Anyone can join (although we DO meet in a pub, so unaccompanied children aren't allowed). You will need a ukulele - but if you just want to come along and meet us before actually spending money on an instrument, you can borrow a ukulele for the evening. Please let us know beforehand if you want to do this. If you play a banjo ukulele or a resonator ukulele we might well ask you to put a sock in it (literally!) as they are much louder than their guitar bodied wooden brethren and everyone deserves to be heard! Want to play another instrument along with us? Sorry, we are a ukulele group. Other suggestions for additions are welcome, but if you are a trombonist or death metal guitarist, we probably aren't the group for you! If you want to come along, just turn up - or feel free to contact us in advance. If you want more information about the music we play, the go the 'The Music' page. Oh - and you'll be wanting to know how much all this costs? Nothing. The meetings are completely free. You will have to buy your own beer though!